I needed a suit – the one that I do have doesn’t fit anymore, so I made one! I’ve got to say it is great when you can make one to your own specifications – and you can save so much! I found a gorgeous wool herringbone stripe in a charcoaly slate colour. It is very fine and loosely woven (ie, frays when you just look at it) but is very covetable. I blockfused everything except the backs and sleeves, where I reinforced the seams with fusetape to prevent seam slippage. This jacket isn’t my design – I unashamedly drafted it from a picture out of a magazine! It is rare that there is nothing I want to change about a design (after all that’s probably why most of us start sewing! ), but this was one of those instances. The jacket is too large for the mannequin and looks floppy on her, so I ‘m showing you just one side to try and demonstrate how it fits on me. Once upon a time we were exactly the same size, which was very convenient, but I am afraid that is no longer the modern day reality. The pocket is quite cute isn’t it? Studying the photo I really wish I sewed it on from the inside, the edgestitching and herringbone weave clash. I did bound buttonholes because I don’t have access to a keyhole buttonholer at the moment, but much as I like them I do prefer to finalise my button position at a final fitting. The sleeve head is slightly gathered, and it does look better on real shoulders than my mannequin who is lacking in that area. 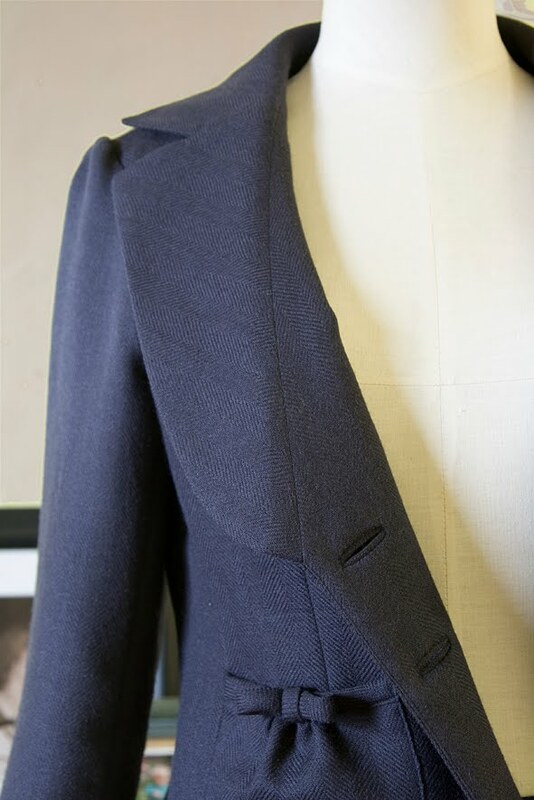 I recently did a tutorial on tailored jacket sleeve vents using this jacket as the sample, so do check it out if you plan on doing these soon – using the correct method they are not hard at all. 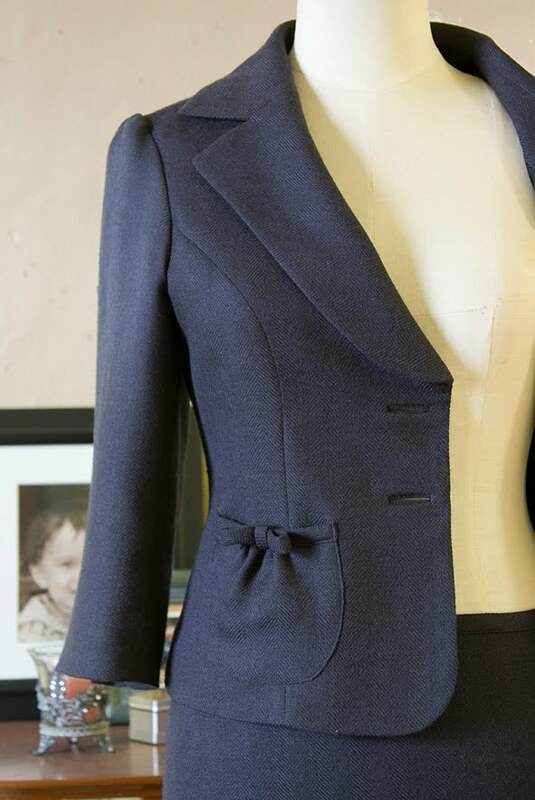 This jacket has a curved front neckline, and it is the first time I have constructed lapels cut separately from the fronts, and I am not entirely happy with how it sits at the break point. This is a soft fabric and sits not-to-bad, but with a heavier weight fabric it wouldn’t be quite so co-operative, so I need to make some cloth allowance adjustments, and maybe strategically trim some seams to enable the roll to form at the correct point. I don’t want to slot both layers of the lapel into the neckline seam as I have seen in cheap ready-to-wear, so suggestions welcome! I nearly forgot to mention the skirt! It is a tapered pencil skirt, with side back seams. The lower centre back panel has a horizontal seam with some flirty gathers and a bow trim just like the pocket! Plus – I have a dress length of fabric left over that I should be able to squeeze a shift dress out of! But I think I’ll make a trench coat first…..
this is fabulous! I'm not a fan of suits but that doesn't mean I can't appreciate them… I love the details on this, absolutely beautiful work. Sherry, the suit is truly gorgeous! I love suits, but don't get to wear them much any more. The pocket is cute … love, love, love it! You are so very clever and thank you for the tutorials you give too. Beautiful, precise sewing. Delicious pocket detail. I'd love to see the whole outfit, including the flirty back on the skirt, on you. And Kay I promise to get a full outfit shot soon – at the moment DH is overseas with my camera! Glad to hear we will get to see the skirt too. Love suits, and this one is just gorgeous!! It's absolutely beautiful. I love the pocket, very cute. I can't wait to see the pictures of you modeling the whole suit. I am sure you will look fabulous! Beautiful, very neat sewing and the style is so nice too. Love the pocket detail. Gorgeous! Love the pocket detail. I don't have to wear suits to work but if I did, I'd be looking for something just like this. Your sewing skills and attention to detail are impeccable, really nice work! Wow! Another beauty! 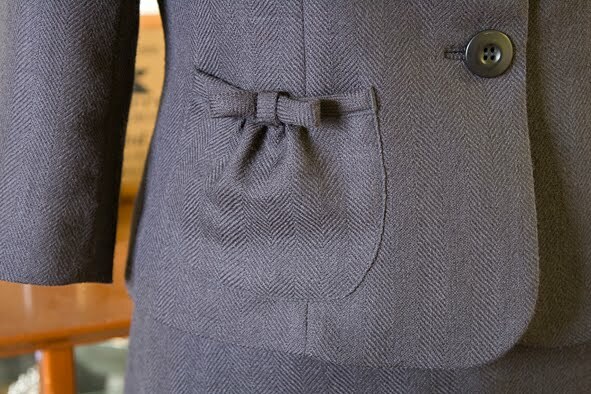 I love the girly pockets and the lapel. You are amazing. It looks awesome! Amazing job on the jacket! WOW!! You are so talented! Simply gorgeous! I thought you might like the patterns! What a fabulous jacket – I am so impressed with your creativity and skill. I love everything about it but particularly love those beautiful pockets with the cute bow! This looks simply amazing! I don't see a problem with the lapels at all in the pics. And like everyone else, I just love those pockets!! I absolutely love this jacket! I'm so impressed with how crisp the seams look. Do you have a particularly high end machine? Great jacket. How would you sew pockets on from the inside? ~SewistObsessed – I just have an industrial plain sewer. ~Jodi – With difficulty! 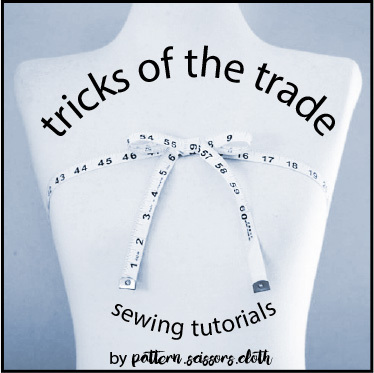 You need to press the seam allowances in, mark the positioning on the front, and squeeze inside the pocket and sew – I promise to do a tutorial next time I sew one! Is there a way to bag a jacket lining when the sleeves have functional vents?